Pregnancy is a time when women are generally more concerned with their health and well being. Health habits and diet improve significantly for many women after hearing the news they are expecting a baby. Chronic health conditions, such as asthma, should be carefully monitored during pregnancy. Each woman experiences asthma differently during pregnancy. Some women find their symptoms improve when they are pregnant, while others experience more frequent or severe asthma attacks. A third group of women find their symptoms remain about the same as prior to the pregnancy. Women worry about taking medications during pregnancy and for good reason since many commonly used medications are not safe for the baby. However, as a result of this fear some women may not take their medication as directed or skip it. This is dangerous since you are depriving both your baby and yourself of oxygen. Controlling your symptoms is the best thing you can do to ensure a healthy baby. Talk to your doctor about your medications as soon as you learn you are pregnant, or even before you conceive. Most of the rescue inhaler type of medications are safe, but your doctor will have the best information on which to take. In the unlikely event that one of your medications isn’t safe or the safety is unknown, your doctor will suggest a replacement medication. It is true that some obstetricians are not completely knowledgeable about controlling asthma in pregnancy or the best medications to use in your case. For this reason, make an appointment with your asthma doctor. He is really the best source of information and can communicate with your obstetrician if needed. When you pack your bag for the hospital, remember to bring along your asthma inhaler. Some women find they experience asthma attacks during labor and child birth. this is very common, so be prepared and keep your medication close at hand, both when you are laboring at home and on the way to the hospital. 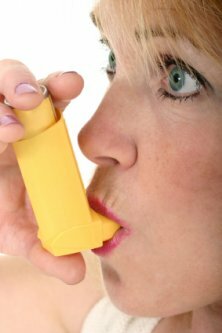 There are a few things you can do to control your asthma. Remember to always consult with your family physicial. One way is to identify and then avoid the things that trigger your asthma. This is different for every person. Dust, pollen, pet dander, mold spores in the air, cigarette smoke and weather are all factors that can contribute to asthma attacks. Avoid the things that trigger your asthma to reduce your symptoms. Infections or viruses trigger symptoms in many people with asthma. You may find your symptoms get worse when you are sick. If you get sick during pregnancy, and most women do at one time or another, visit your doctor. He can determine if any additional medications or treatments are required to reduce your symptoms and help you feel better. Keeping your asthma treated and under control can help prevent many of these problems.